Michelle McCarron - River connections in the heart of Grand Canyon. River connections in the heart of Grand Canyon. 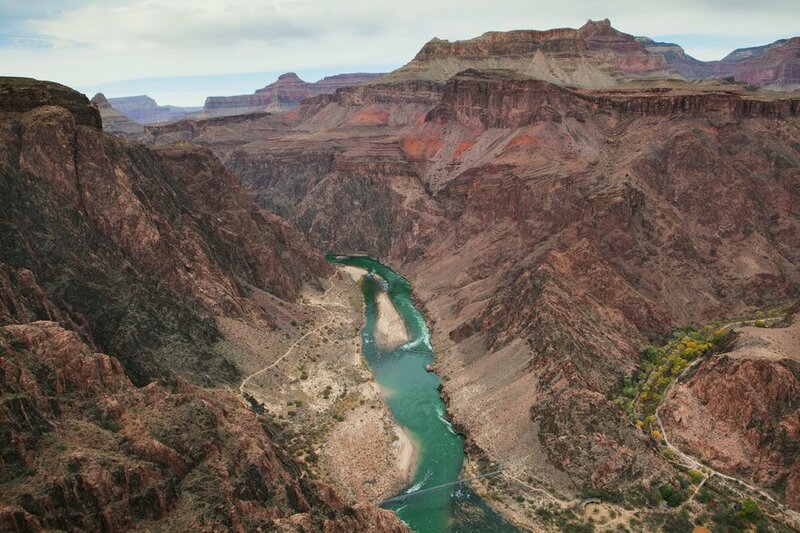 The Colorado river flows through the Inner Gorge of the Grand Canyon. It was a cool crisp November morning as I exited the park bus and walked to the trailhead at the edge of the south rim. At all trailheads there’s always that moment of acute awareness of leaving the familiar behind and embarking on the unknown. When the unknown is the wilderness these steps are very conscious actions destined to help reclaim some of my human essence and gain a better understanding of where I came from and to what I am connected. I’d been on the road for over a month documenting the life of the Colorado river. My friend and writer Will Falk had left just over a week earlier to return to Denver to defend his case as a plaintiff seeking Rights of Nature for the river. We’d crisscrossed Utah and Colorado looking at coal fired energy plants and oil and gas fields spreading like a cancer across the landscape of the river’s upper basin. I’d looked at six major dams on the Colorado and it’s tributaries and saw the infamous ‘bath tub’ rings marking the dropping water level of the reservoir they call ‘Lake Powell’. In the desert of Paige, Arizona I watched jets skiers and boaters zip around the ‘lake’ like Romans oblivious to the frailty of their empire and impending demise. Instagrammers came in busloads for the photo of Horseshoe bend but I doubted that many of them even knew the name of the river they were looking at. It was obvious that the disconnect to the life of the river ran deeper than her deepest canyons. I was weary of the industrial landscape and man and it was time to go be with the river in the greatest of temples she had carved for herself. 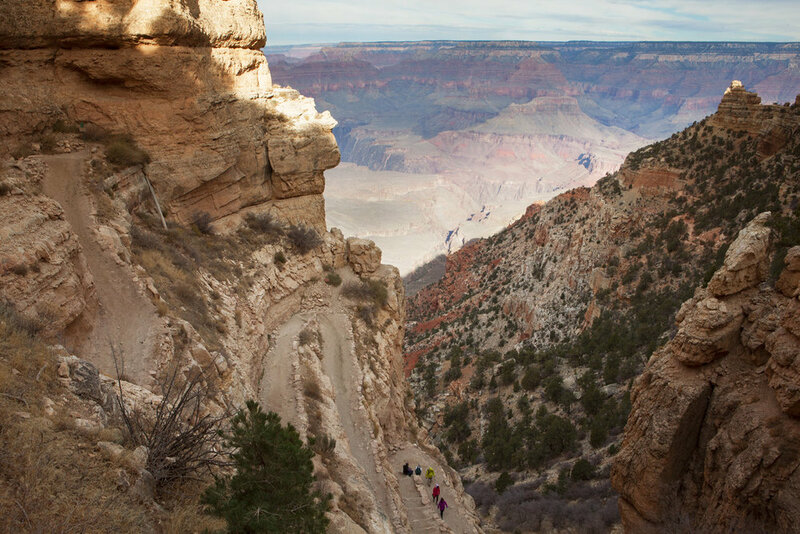 The South Kaibab trail leads six miles (9.6km) down into the Grand Canyon of the Colorado a mile below the canyon rim. The Inner Gorge is so deep that I hadn’t really seen the river yet in this park except for a few distant sightings from the rim the day before. My pack was loaded with camping gear and enough food to last 2 days and nights at Bright Angel Creek campground at the bottom of the canyon. Perhaps I thought I’d find a river marginally better off down here away from the ravages of industrialised man. But as anyone who has looked at human caused environmental problems knows, very little of anything in nature anymore is free of man’s impact. Still, I thought that maybe this would be the best place to feel a little of her spirit. Descending into the Grand Canyon on the South Kaibab trail. Down I went through time with that distinct feeling of journeying as I made my way toward the river in it’s inner sanctum deep below. Hundreds of millions of years of earth’s history were written in the rocks around me and exposed as one of earth’s finest intact records of geologic time. From the ancient seabed of the Kaibab formation and it’s relatively young 270 million year old rocks at the top of the canyon to the Vishnu basement rock laid down 1800 million years ago, I made my way just like the river had done before me. Millions of years from now I wondered what would our time on this earth look like in the stories written in rock. At one point about half way down I caught my first real glimpse of the river in the canyon. It’s green water contrasted with the red rock of it’s canyon walls and the dust that covered my feet. The river too would be red if it weren’t for Glen Canyon dam upstream that blocks and filters river sediment presenting a myriad of problems for native fish, amphibian, insect populations and habitat. I reached the Colorado in her canyon in the early afternoon at Bright Angel where some rafters were taking a break on Boat Beach. Setting my pack down in the sand, I removed my shoes and socks and walked to the waterline to put my feet in the river. For a while I just stood there looking at them under the water and thinking about the significance of the moment. It was the first time I’d done this on the entire trip and it was long overdue. 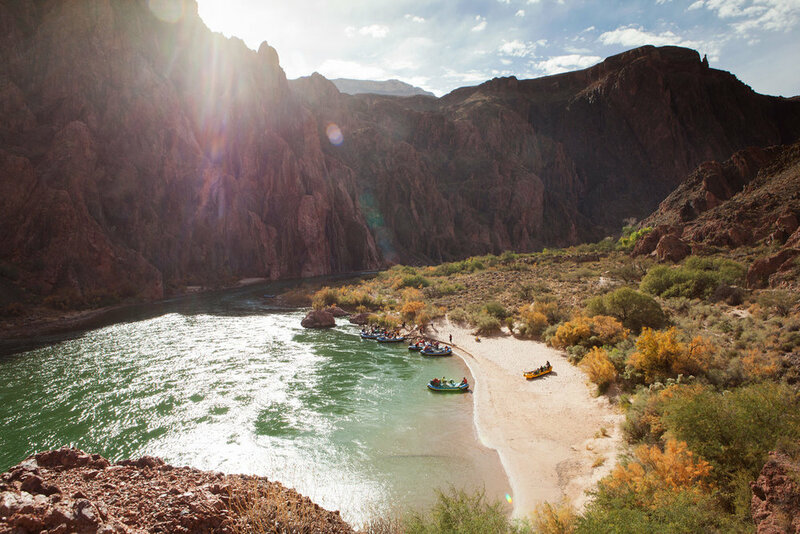 Boat Beach at Bright Angel in Grand Canyon National Park. I set up camp on a site just under a rock face with the dappled sunlight seeping through the abundant Cottonwood trees lining the creek. A strong wind had come up and sand was swirling about everywhere so I crawled inside my tent to escape it. I’d left the fly sheet off for now and lay on my back gazing through my tent roof at the world outside. ‘Here I am’ I thought as I listened to the wind rustling the cottonwood leaves, the creek tinkling and the river humming in the background while feeling sleep quietly take over. I met Rick Jurgen when I spotted him fiddling with a fish trap that was sitting in the middle of Bright Angel Creek about a hundred meters upstream from it’s mouth with the Colorado. Through my curiosity for what he was doing I learned he was a veteran volunteer on the fish program in the park. For at least 10 years Rick had been coming here from Maine to help out. Non native introduced trout have wrecked havoc on native species and like stories everywhere of invasive species, humans are going around trying to hand pick them out. For the river, it’s just another challenge in a long line of health issues. Rick Jurgen checking the fish trap at Bright Angel Creek in Grand Canyon National Park. The problems facing the Colorado river are no different to problems facing rivers everywhere. Pollution, species decline and too many people expecting and taking too much from a finite and dwindling resource will eventually force a tipping point in the rivers life. The reservoirs in the upper basin of the Colorado are emptying as the climate is warming. The seven states that depend on the Colorado’s water are already fighting over who should share the burden of an over-tapped river yet none consider that they have to diverge from the path of business as usual. I went for a walk in a short loop using the two bridges that linked the opposites sides of the canyon. Silver bridge swayed as I crossed sheepishly with the river roaring beneath me. On the south side the trail butted up against the canyon walls and I became lost in the patterns of the pink Zoroaster granite in the rock face. I was staring at some of the oldest rock formation on the planet in a canyon that some experts estimate took the river 6 million years to carve her way from the top of the plateau. Out of the corner of my eye something moved and I turned to see a rock squirrel sitting and munching beside the skeleton of a mule deer. Below on the river another raft floated by carrying it’s passengers towards the next set of rapids and shots of adrenaline just downstream. John Wesley Powell, explorer, geographer and geologist led the first expedition to successfully navigate the river through the Grand Canyon in 1869. His experiences made him undoubtedly the most knowledgable coloniser on the climate and environment of the American west in his time. For years afterward and until his death in 1902 he advised against unsustainable development in the desert warning that “when all the wells have been dug that can be dug in this arid region, there is still not sufficient water to irrigate all this arid region”. Yet still we think we can turn deserts green. To get a higher vantage point and away from people I went for a hike up Clear Creek trail on the river’s north side. At some random point where I could see the river and contemplate her in peace I stopped and sat down. What I’d witnessed for most of my journey the past month along the river contrasted sharply with what was in front of me. I wondered what was the point of this protected oasis so revered inside these invisible park boundaries. Are National Parks just false human constructs designed to make us feel like we care? If not, why could we seemingly respect the river inside the national park and abuse it so fervently as it flowed outside? My frustration and hope for the river ebbed and flowed with her journey. I lifted my gaze from her as the last pink rays of golden hour light grazed the tops of the peaks above me and darkness eventually descended through time. The Colorado River and the Inner Gorge of the Grand Canyon. I broke camp the third day shortly after daybreak for the 9.5 mile (15kms) hike out of the canyon on Bright Angel trail. Before I left the river and started ascending away from her I took off my shoes and socks one last time and waded in to my ankles. The river flowed over me and her current flowed through me. We are inextricably connected her and I, my life dependant on hers and hers on how I choose to live mine.